You might call this a symbolic portrait. 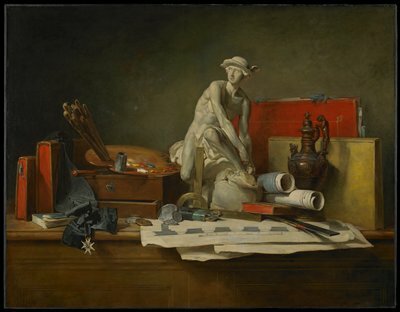 Like a self-conscious suitor who leaves certain books or magazines lying around his apartment before inviting a date in, Jean-Baptiste-Simeon Chardin has assembled the accountrement of the arts—sculpture, drawing, architecture, goldsmithing—and its rewards, most notably a prestigious medal, as though they were just sitting there on a desk. Image: Self-portrait, 1771, pastel, Musée du Louvre, Paris.